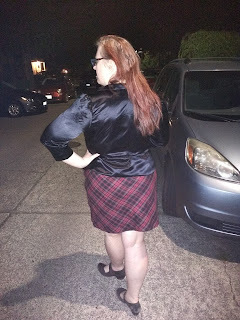 Clothing Hacker: Fabricista Fashion Challenge #3 finished product! 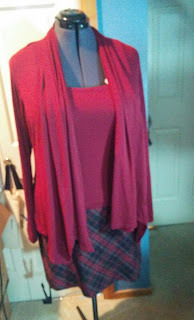 Fabricista Fashion Challenge #3 finished product! 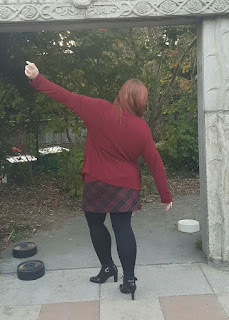 The details of the 3rd challenge can be found here, along with the results of the second challenge (spoiler: I was safe.) But basically we needed to pick something from our closet, home made or store bought, that doesn't get much wear and create two items to go with the chosen item. I was very excited about this challenge. I had a couple options for my garment to use, but I chose a red and black plaid pencil skirt that I bought a couple years ago at a thrift shop and have never worn. I knew right away that I wanted to do one red top and one black top to go with it. My original plan for the red was a red lace top and a matching red tank to wear under it. 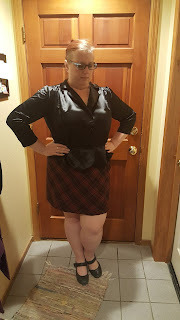 And I wanted the black top to be something a bit more structured with a fit and flare shape to it. With that in mind, I drew up these sketches. The body proportions in my sketches are still fairly off, but I am choosing to do full sketches instead of using croquis because I am actively trying to improve my skills. 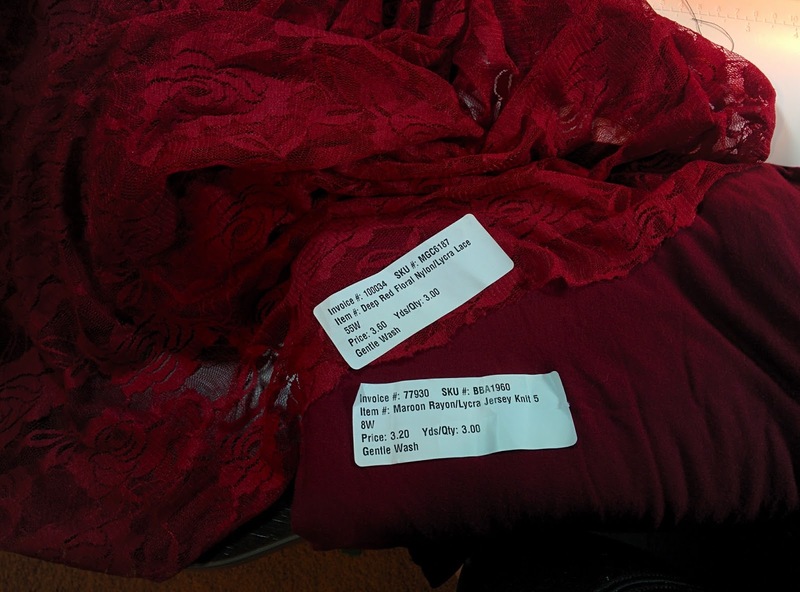 For the red, I was planning on using two fabrics in my stash that were both purchased from Fabric Mart and still had the stickers on them. I made the red tank top using the Love Notions Luna Loungewear pattern. 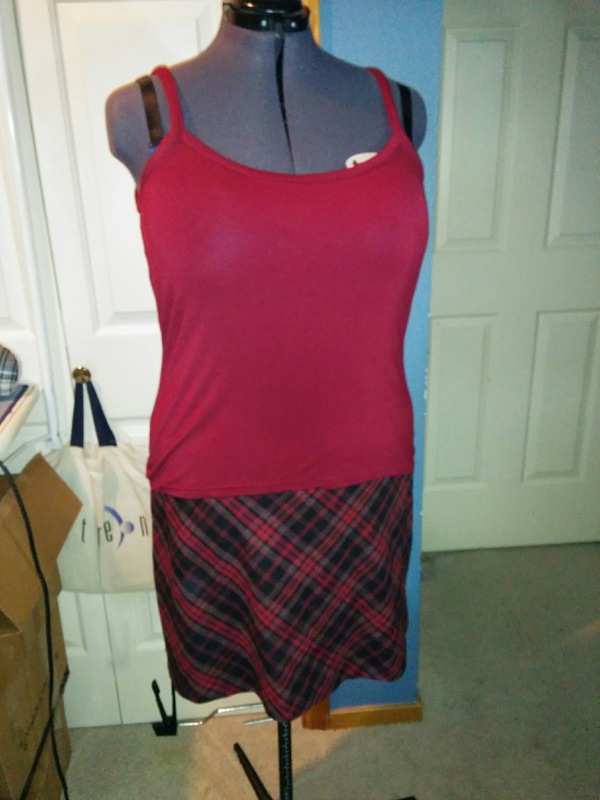 I don't typically do a real FBA on knit paterns, so I simply used the XXXL at the bust and blended down to the XL at the waist and hips. It came together very nicely and pretty quickly and I love the fit. I wear a lot of tanks around the house and under clothes, so this pattern is definitely a keeper. 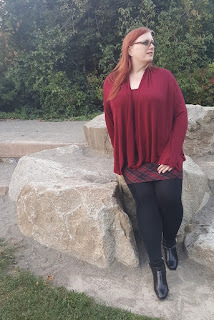 For the lace top, I used the Seamwork Aberdeen, with the cut-on sleeves lengthened and then drafted my own bell cuff to the sleeve. I don't have any photos of it, but I hated the way it looked. 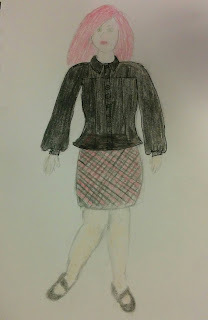 I had such high hopes for the look because of my sketch, but my execution just didn't look good. I loved the color of that tank top with the plaid skirt so I decided to scrap the lace and use the remaining yardage of the maroon knit for a Swoon Scarf neck cardigan. I love, love, love this duo! My daughter and I went down to the corner to the park for a photo shoot and I'm so pleased with how these photos turned out. Technically, this is two items I made to go with my skirt, however, I will never wear either by itself, so I think of it as one as far as this challenge goes. 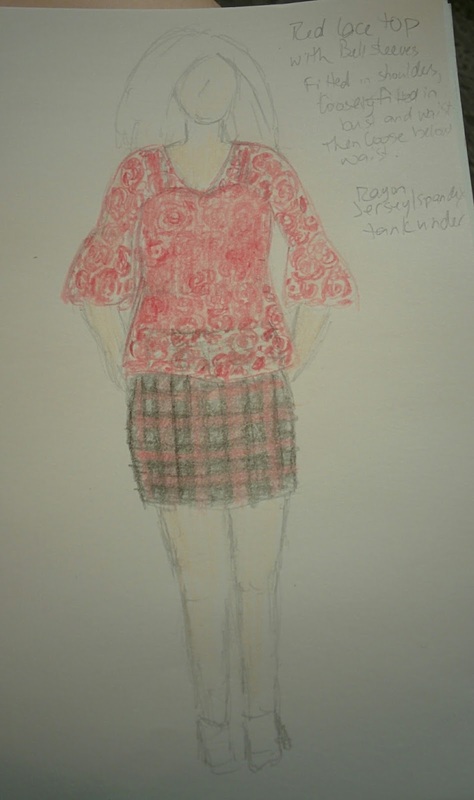 For the second item, I had a hard time finding a pattern that met the image I had in my head. I considered drafting/draping something myself, but I have very little experience doing that and I was concerned that I wouldn't have enough time to work everything out and still get something completed by the deadline. 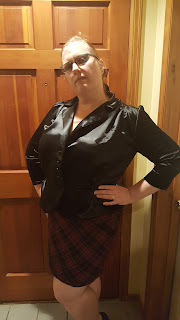 So I chose to modify the Sew Over It Vintage Shirt Dress to be a peplum blouse. 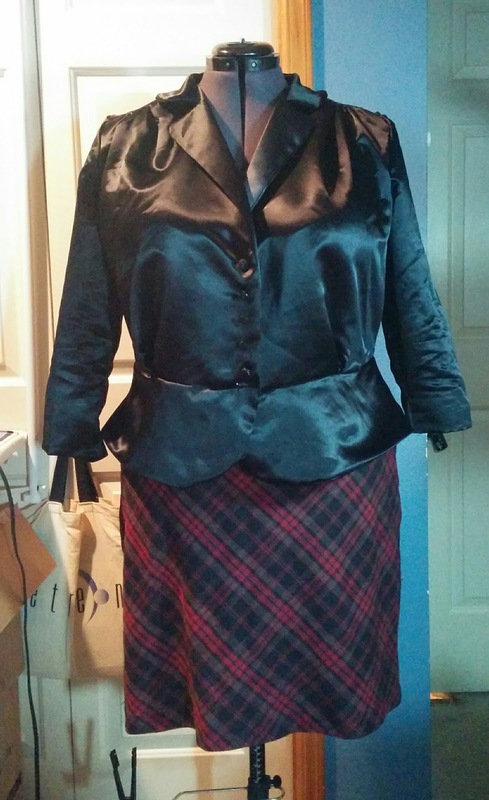 I chose a black satin that is a little heavier because I thought it would lend a little extra structure to the top. I had to do a 4" FBA on the largest size, size 20. Other than that, I used the bodice as is and cut the skirt 6" long and shaped the front to be curved. 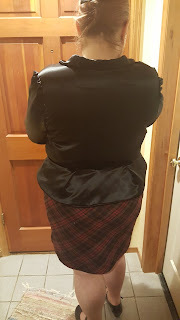 The back had two small pleats on the sides, but after we started trying to photograph this top, every little fold, pleat, ripple, etc. 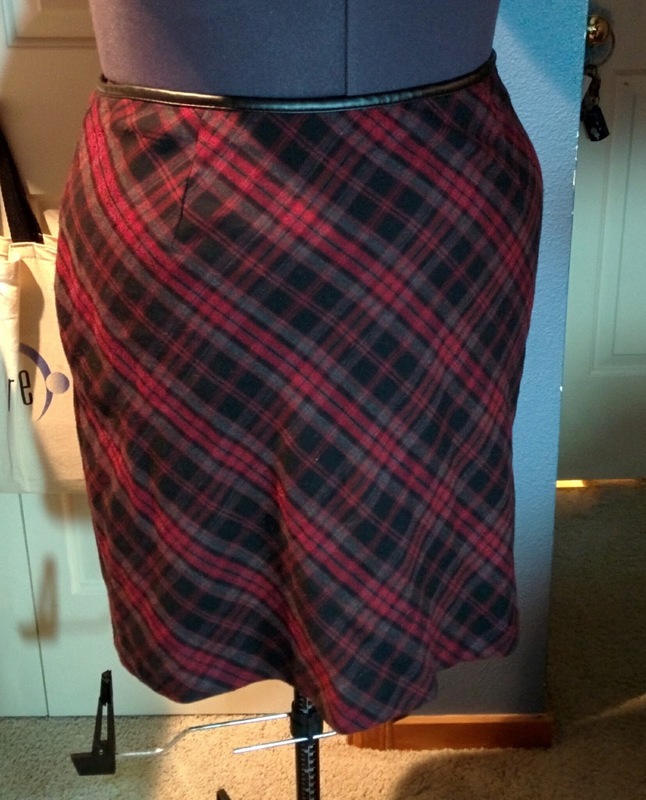 showed up magnified by 1000 and the back just looked extra messy in the photos, so I quickly re-did it to have a single pleat in the middle. 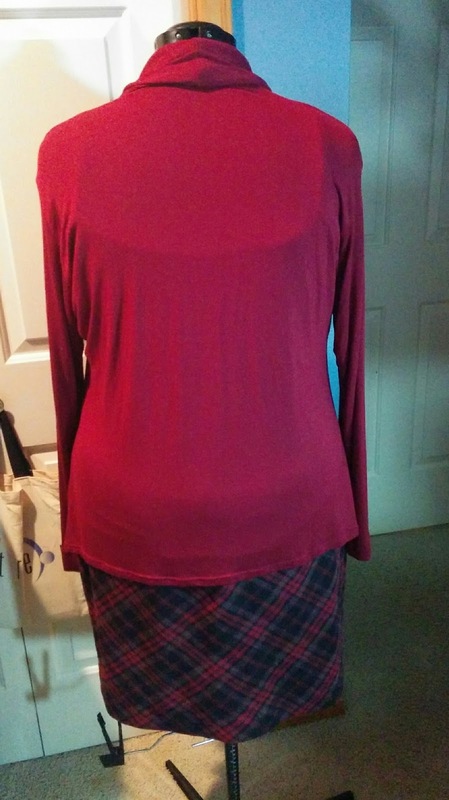 The after photo looks like there are folds radiating out from the pleat, but it really doesn't look like that in person. 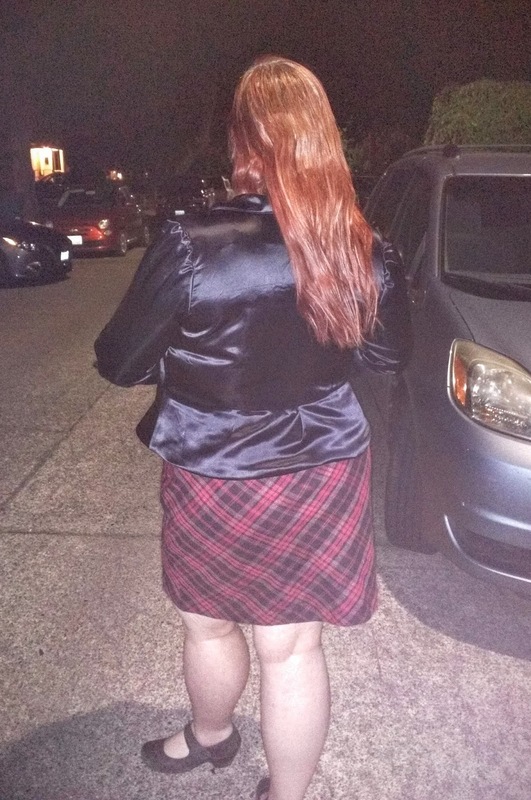 In fact, here's a photo where I'm in the same pose and just had my hand on my hip and you can see how drastically different the back peplum looks. We were all amazed at how different this top looked in the photographs vs. how it looks in person. If anyone has any tips on what we could have done differently, I'd LOVE to hear them. 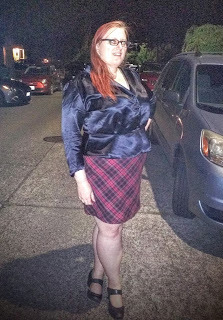 Other than taking photos during the daylight, of course, which wasn't an option this time. We took dozens and dozens of photos in various spots inside my house and even went outside to try by streetlight. The street light photos turned out fairly interesting, but unfortunately it was still hard to see the top very well. And I have some nice, glowing eyes that I don't know how to fix. I guess I should really work on my photo editing skills! 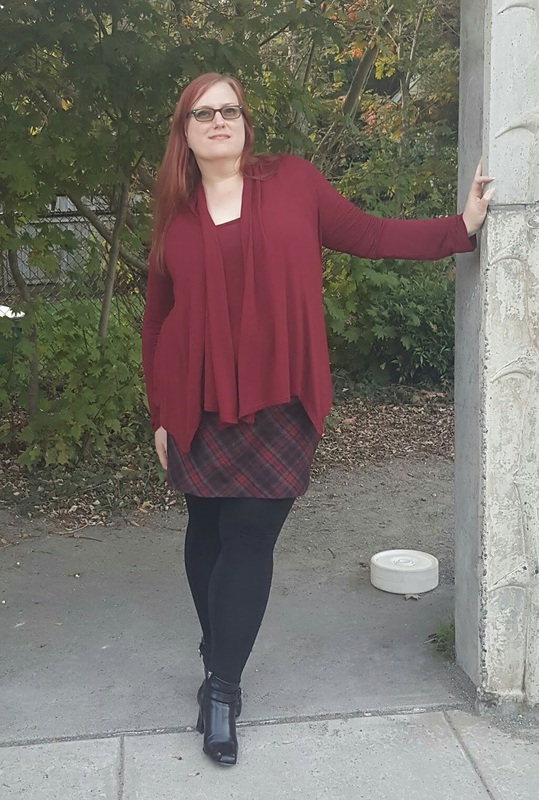 I have some seriously stiff competition this week, so I'd really appreciate any and all votes so I can make it to the final round next week! Go to this post on the Fabric Mart blog to see all the entries and use the "VOTE NOW!!" link at the bottom of the post, right above the comments, to choose your favorite. This week's pics are your best so far in this competition. Love the sweater set. Thank you so much. I'm very pleased with my sweater set, and my daughter did a fantastic job with the photos. 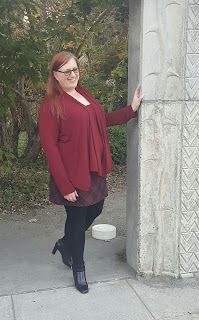 I'll definitely be using that cardigan pattern again! I really love your sketches... They're so helpful in getting your brain on paper! 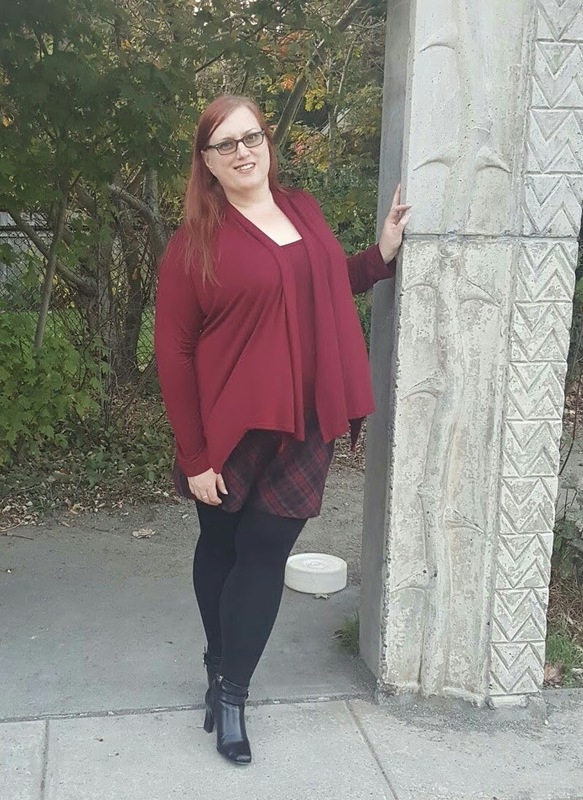 The cardigan is a great fit too and works so well with the skirt! Fabricista Fashion Challenge #2 finished product! Fabricista Fashion Challenge #1 finished product!